Leichhardt City Council is implementing a program to build three new childcare centres by 2022 to meet growing demand. 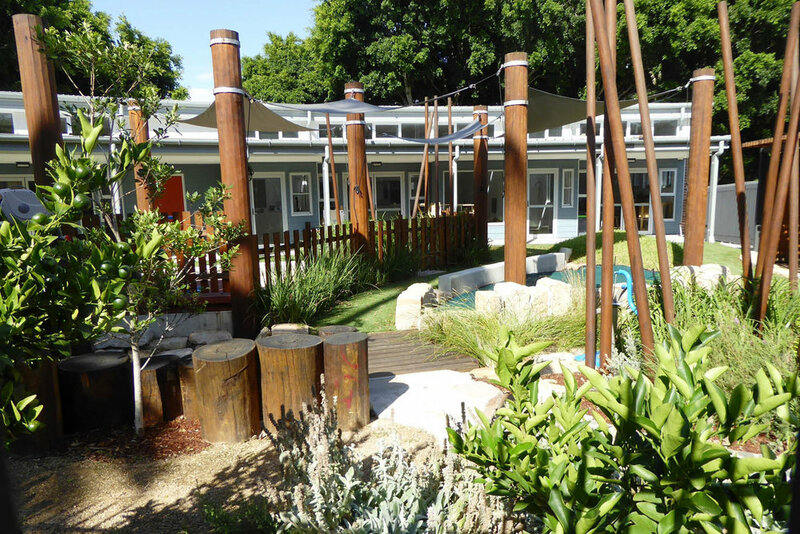 One of these centres is located on the southern edge of Leichhardt Park and designed to accommodate sixty children. Corkery Consulting was engaged by Leichhardt Council to prepare the design concept, detailed design and documentation for the outdoor play areas associated with the childcare centre, working in collaboration with Dillon Savage Architects. Design of the outdoor areas has provided coordinated play opportunities for children across a range of age groups. The scale of spaces, types of play opportunities and materials used have been designed for each age group. A number of site challenges were also addressed, including constrained drainage created by the flat site, existing mature trees on the boundary and soil contamination. Designed to accommodate sixty children the outdoor spaces provide coordinated play opportunities for children across a range of age groups. Three separate outdoor spaces provide play opportunities for children in age groups of 0-2 years, 2-3 years and 3-5 years. The scale of spaces, types of play opportunities provided and the materials used were designed to meet the needs of each age group. Council’s child care manager and staff were engaged in the design process through regular meetings and consultation to ensure knowledge gained through their involvement in existing child care facilities was incorporated in the design of the new centre. Particular focus was given to the design of the outdoor spaces to encourage children to engage with nature. This was achieved through the incorporation of natural materials that include sand, water, timber, sandstone boulders, stone paving, mulch, grass and plants. The play spaces are designed to challenge the imagination of children and allow them to develop physical and social skills as well as an appreciation of nature. Use of traditional play equipment was kept to a minimum to encourage imaginative play. A wide range of surface materials were used to provide tactile experience for children. These included decomposed granite, soft fall rubber, turf, granite sets, timber and concrete. Planting within the outdoor play spaces was generally limited to small trees, fruit trees, low shrubs, climbers, ground covers, ferns and a variety of native grass species. Selection of species took account of potential allergies while presenting children with opportunities to experience different colour, textures and scents. Special containers were designed for fruit trees to provide low shade and produce fruit and help children be aware of the connection between fruit and where it comes from. Herbs included in the groundcover planting also play an educational role by engaging children’s senses of smell and touch. A strong focus has been placed on the provision of shade throughout the play areas. This includes shade cloth together with a timber slat structure that incorporates a timber fence to provide visual screening of the adjoining car park. Shadow patterns cast by the timber slats create visual interest on the ground surface. A circular shade structure incorporating timber slats not only provides shade to play areas below it but also forms a distinctive sculptural element within the play space. engaging patters on the pavement to add to the spatial quality of the entry space. A number of site challenges were identified and addressed through detailed site planning and landscape design. The flat site topography required very careful drainage design working in collaboration with the hydraulic engineer and building architect. Soil contamination that had resulted from previous site filling activities on the site was addressed by a Remedial Action Plan prepared by an environmental engineering specialist. The RAP required that the top layer of contaminated soil be excavated and an impermeable membrane installed with imported top soil placed over the membrane throughout the landscape areas to provide adequate soil volume for the healthy growth of plants. Detailed landscape design included determination of top soil depths and incorporation of sub-soil drainage to allow successful growth of plants. Plants form a key part of the nature learning environment for children. The pallet of plant species was selected to provide children with opportunities to experience the feel and smell of different plants. Small citrus trees are producing fruit and a number of herbs growing in the outdoor spaces are being used by staff.